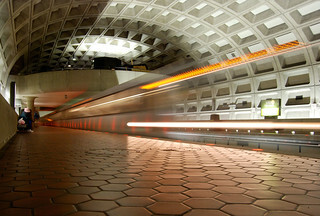 An Orange Line train arriving at Clarendon on Inauguration Day. Having walked from the Washington Monument to Clarendon, we decided it would be a great idea to switch to mass transit for the final jump from Clarendon to Virginia Square (hey, every foot counts! ).